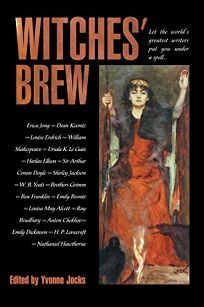 Aimed at a more popular audience but with an equally impressive contributors' list is Witches' Brew, edited by Yvonne Jocks. The volume boasts bewitching tales from the likes of Erica Jong, Louise Erdrich and Kathryn Ptacek, along with pieces from such unusual sources as Cotton Mather, Ben Franklin and theosophist H.P. Blavatsky. Readers should know that August Derleth wrote ""Witches' Hollow"" based on a note by H.P. Lovecraft, contrary to the editorial claim that Derleth completed an unfinished Lovecraft tale.